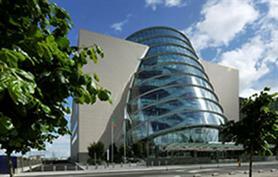 The Convention Centre Dublin (CCD) has announced five major conferences taking place over the next 12 months. NetApp Insight 2012 takes place in November, with 2,300 delegates expected, and will return to the CCD in 2013, as part of a two-year deal. The annual eHealth Week Conference will come to the city in May 2013. Organised by the Healthcare Information Management and Systems Society (HIMSS), this three-day event coincides with the Irish Presidency of the EU and will welcome 2,500 delegates. Also in 2013, th e5th International Congress of the European Society for Child and Adolescent Psychiatry (ESCAP 2013) will take place in July, with over 2,000 delegates, whilte the 16th Annual European Congress of the International Society for Pharmacoeconomics and Outcomes Research (ISPOR) will take place in November, with over 3,300 attendees expected. "We have had an incredible year at The CCD and continue to secure a wide range of large international events", said Nick Waight, chief executive, The CCD. "Dublin as a destination and The CCD as a venue, are proving extremely popular with organisers and delegates, with our client satisfaction rates consistently above 96%.